Do you worry about the ingredients in your dog’s treats? At the pet store, I am constantly looking at the ingredients in treats. It is amazing how many of them have mile-long ingredient lists, and all too often have the worrying “made in China” label. As someone who prefers natural treats, either made from whole grain ingredients or preferably grain-free, I feel I am constantly scrutinizing treats. Things get even trickier when we are traveling, especially if I want a quick bag that can easily be resealed to keep the treats fresh (I know I can’t be the only dog mom who keeps treats in her SUV). To help celebreate National Treat Day today (February 23 – who knew? ), Milk-Bone asked us if Ivi & Rylie would be interested in trying these new treats. After looking a bit at them online, I was excited to see what my girls thought of Milk-Bone Farmer’s Medley Treats. Milk-Bone Farmer’s Medley Treats: What Are They? Looking for yummy whole-grain or grain-free treats that can fit into nearly any budget? 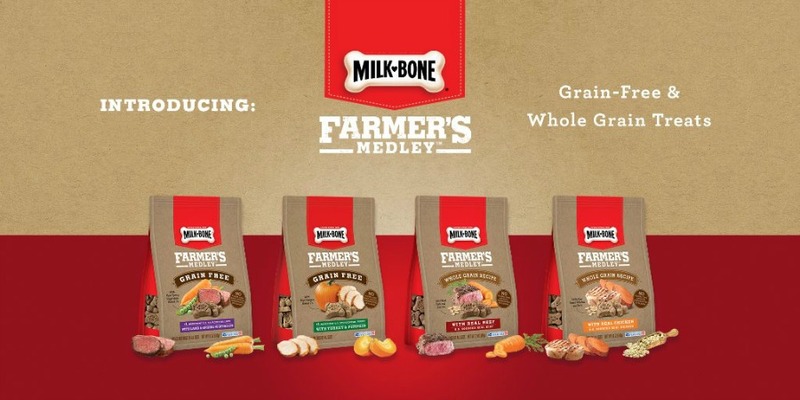 If so, we think you will love Milk-Bone’s new Farmer’s Medley Treats! Inspired by local farmers’ markets, these treats are made using USA-sourced meat and contain no fillers, including corn, artificial flavors or preservatives. As well, these treats are also made in the USA too (the whole grain variety in Topeka, Kansas and grain free in Ogden, Utah). Who knew finding a healthy dog biscuit could be so easy? So far, I have to say that I’m impressed with these treats. Unlike many treats out there, the ingredient list is fairly small; something this dog mom likes to see. As well, they offer a variety of different options when it comes to their whole-grain and grain-free lines of these treats. 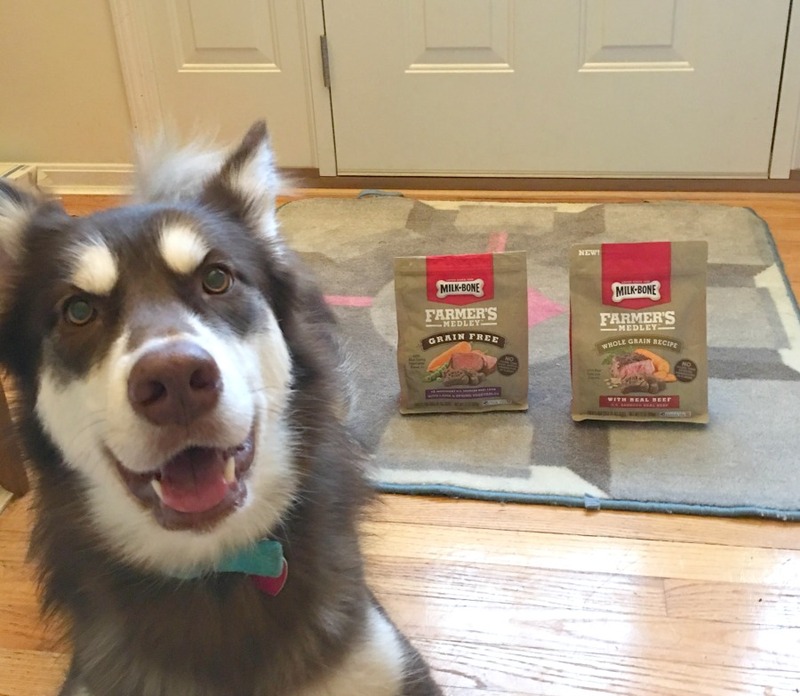 Having affordable, grain-free treats available for training is always a major plus in our household, and this dog mom is always happy when there are healthy alternatives that are easy to keep on hand. What I have to say I like the most, however, is our dogs’ response. Both of our girls absolutely love these treats, making them a great addition to our doggy treat jar, or emergency car treat! Want to pick up some of these yummy treats for your own dog? You can buy Milk-Bone Farmer’s Medley Treats in the grain or grain-free varieties at a pet store near you or Amazon.com! Make sure to pick up a bag today for National Dog Biscuit Day or anytime you want to spoil your pup with a yummy treat! Want to learn more? Follow Milk-Bone on Social Media! Yes they have – my only dog that didn’t used to eat them was Ivi. She obviously can’t have the turkey ones but absolutely goes crazy over the others. I love that the ingredients have just been getting better over the years! Thanks for the info. I’ve never given these treats to my Dexter, but I will be looking for them on my next shopping trip. My doxies love milk bones, they will definitely be trying these. Unfortunately most people do not realize healthy does not mean expensive. These are a perfect example of how healthy does not have to break the bank. My dog loves these treats! I love that they are not too pricey, something my little guy loves, and not filled with a ton of preservatives! I love this, i will be buying these for my pup Buster. I’m so glad to see that wheat free are an option. 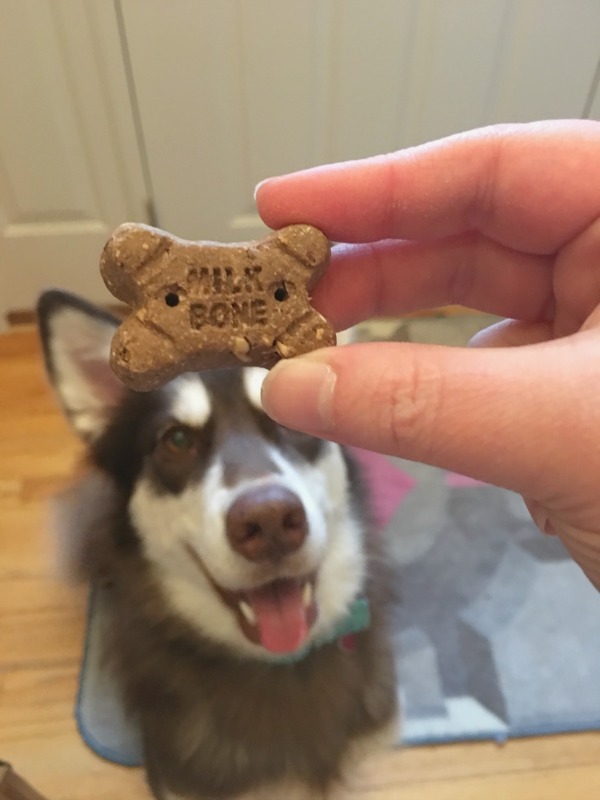 These look good and I love Milk Bone brand! I’ll look for these when I shop tomorrow. I would only purchase healthy treats for pets. This Milk-Bone Farmer’s Medley Treats does look terrific. I ALWAYS WOULD BUY FOR MY DOG. THE PRICE WAS THE MADE REASON AND THY HAVE BEEN ON THE MARKET FOREVER. BUT, THE MAIN REASON IS PRINCESS LOVE THEM. I WILL BUY THE NEW RECIPE FOR HER SOON. I’ll have to try these! I spend so much money on some of the high-end dog treats. And honestly, my dog prefers milkbone! Now that they have this grain-free version I think I have found the perfect treat for our pup. These look like good treats. I have a dog who loves to get treats after she goes outside and after I eat my dinner. It’s gratifying to see a popular dog food company finally come out with more natural treats! I’d love to give our senior dog quality treats. I’ve always gotten my little poochies Milk Bones. The ingredients in these Farmer’s Medley Milk Bones are so much better than most dog treats and are going on my grocery list for the furbabies. Thanks for the review! They sound fabulous!! I love a tried and true company that can branch out and create something new and fabulous!! Milk bone treats have been a reward for our dog over many years.and she still loves them. Good to know that we can find ones that have healthful ingredients. My sister’s dog loves these treats! The only treat she will eat. Glad to learn how healthy Milk Bone treats are. We use them for our dog some. Great information here. Thanks! My dogs love their treats and bones.Will have to try these. We buy treats for our local shelter and try to look for good ones. These seem to be a good option at a reasonable price.